Native to Argentina, Bolivia, Brazil, and Paraguay, the blue potato bush is cultivated all over the world for its beautiful deep purple-blue flowers. If you’ve ever seen it bloom, you won’t forget it. The Royal Horticultural Society gave Lycianthes rantonnetii their prestigious Award of Garden Merit in 2012. Several cultivars have been produced with different colored foliage and blossoms. The cultivar Lycianthes rantonnetii 'White' has beautiful snow white flowers, while Lycianthes rantonnetii ‘Variegata’ has cream and grey-green leaves with blue flowers. All varieties are sweetly scented and attract butterflies. If not pruned, this species will also produce berries which will attract a variety of birds. Important note: All parts of this plant are poisonous if ingested, including the seeds and berries. Pet owners should monitor their dogs, in particular, to ensure they do not eat the berries or other parts of this shrub. Named after the 19th-century French horticulturist, Barthélémy Victor Rantonnet, the botanical name for this plant is generally accepted as Lycianthes rantonnetii. It is also known as Solanum rantonnetii. The genus name is taken from the Greek word lykion which means ‘a thorny bush’, and anthos which means flower. Widely known by the common name of blue potato bush, this species is also called blue Lycianthes, Paraguay nightshade, and royal robe. The use of the common name of nightshade is not surprising because this plant was mistakenly thought to be one of the nightshade species, even though it is not. This species is suitable for planting in USDA hardiness zones 8 through 11. In colder zones, it may drop its leaves in the winter, while in the warmer zones it remains evergreen. 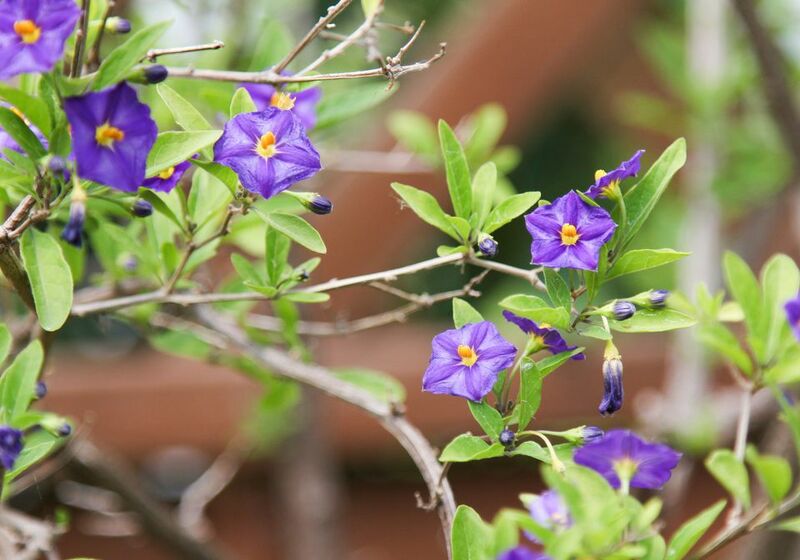 The blue potato bush is a fast growing evergreen that will grow to as much as ten feet in height and width. Typically they are pruned back to a much smaller size. They can be pruned to almost any shape and are often trimmed to a round shape with the lower foliage clipped, thus resembling a small tree. Blue potato bush prefers full sun if possible, but will tolerate partial shade. This species fare well in coastal regions but should be protected from strong winds. Leaves of the blue potato bush are oval to elliptical, alternate, and grow up to six inches long and three inches across. They are described as an evergreen in warmer zones and deciduous in zones that are cooler. The smooth gray-brown branches grow in an arching fashion, sprawling to well over six feet if not pruned. The flowers of this species are what make it memorable. Striking masses of deep violet-blue flowers with yellow centers are grouped at the leaf axils. In cooler zones, blossoms are produced from March through October, while in the warmest zones it may bloom year-round. Flowering is most prolific during the summer months. Fruit is produced in the form of orange-red oval berries that are up to an inch in size. The fruit is not edible, and like other parts of the plant is poisonous if ingested. Each berry produces approximately two dozen dark brown seeds. Well suited to many garden types, the blue potato bush makes an excellent backdrop for small shrubs and perennials. It can be used as a focal piece in a garden or mixed in with other plants as a border. This species can also be grown in containers and makes a striking display on a patio. Another use for the blue potato bush is as a hedge or screening plant. They can be grown into a small potted tree by removing the lower branches and pruning the remaining foliage to the desired shape. Take care with placement, as all parts of this plant are poisonous. The berries, in particular, might be appealing to young children. Regular watering is important, particularly during the first growing season. During times of high heat water more frequently. The soil should be well-drained but not allowed to completely dry out before the next watering. Apply a slow-release fertilizer in the spring just before new growth begins. If planted in a container, fertilize once a month with a liquid 10-10-10 fertilizer. Mulch roots with compost in the spring and again in the fall. Although this species requires little maintenance, it should be pruned regularly to maintain a pleasing shape. Lightly pruning after each batch of flowers will result in a compact shape and encourage greater blossoming. Primary pruning should take place in the winter months after blossoming has ceased. No more than one-third of the stem should be cut back. If managed well, this species can be pruned to a round shape with minimal loss of flowers. The blue potato bush is susceptible to pests such as aphids, caterpillars, and thrips. Aphids can be removed by directing a strong spray of water early in the day to allow leaves to dry before nighttime. Thrips can be managed by the use of horticultural oils, neem oil or spinosad. This species may also suffer from blight, damping-off, stem rot, powdery mildew, gray mold, as well as viruses.